Sunrisers Hyderabad and Rajasthan Royals, both the teams have started their campaign on a losing side. Now the teams will look to win their first match in the 12th season of IPL. Sunrisers Hyderabad is all set to take on Rajasthan Royals on Friday, March 29, 2019, at Rajiv Gandhi International Stadium, Hyderabad. If you are looking for the best choice for captain and vice-captain, Dream11 Free Teams to win the grand league, predicted playing 11 and RR vs SRH full squad then you are at the right place. Winning and losing is a part of fantasy cricket but our funda is very simple we predict, the players perform and you win. If you really want to win then make sure to read the post carefully so that your winning chances increase to 100%. All the information, data and statistics that we provide are well researched and almost 100% accurate. Sunrisers Hyderabad has almost won their last match but Russell ruined their party by playing an outstanding inning. They are in the fifth position of the points table. David Warner, Jonny Bairstow and Vijay Shankar are the top scorers of SRH team. They have scored 85, 39 and 40 runs respectively. Shakib Al Hasan, Sandeep Sharma, Siddarth Kaul and Rashid Khan took one wicket each. On the other hand, Rajasthan Royals have disappointed their fans by not chasing a chaseable total. They are in the seventh position of the points table. Jos Buttler, Sanju Samson and Ajinkya Rahane were the top scorers of RR team. They have scored 69, 30 and 27 runs respectively. Ben Stokes took 2 wickets. Krishnappa Gowtham and Dhawal Kulkarni took one wicket each. David Warner, Vijay Shankar, Jonny Bairstow/Kane Williamson, Yusuf Pathan, Shakib Al Hasan, Rashid Khan and Bhuvneshwar Kumar are the key players of Sunrisers Hyderabad Team. Kane Williamson, if plays will lead the SRH team. Williamson has not played his first match and the SRH team management will take the final decision on him on the match day. David Warner, Jonny Bairstow/Kane Williamson and Manish Pandey will lead the batting department. Bhuvneshwar Kumar, Siddarth Kaul and Rashid Khan will lead the bowling department. Vijay Shankar and Shakib Al Hasan will play as a key all-rounder. David Warner and Rashid Khan are the most valuable players of SRH. Batsmen: David Warner, Yusuf Pathan, Manish Pandey, Deepak Hooda. All-Rounder: Shakib Al Hasan, Vijay Shankar. Bowlers: Bhuvneshwar Kumar, Rashid Khan, Siddarth Kaul, Sandeep Sharma. Bhuvneshwar Kumar (c), Jonny Bairstow (wk), Siddarth Kaul, David Warner, Ricky Bhui, Vijay Shankar, Shreevats Goswami, Yusuf Pathan, Martin Guptill, Manish Pandey, Mohammad Nabi, Deepak Hooda, Basil Thampi, Shakib Al Hasan, Kane Williamson, Rashid Khan, Shahbaz Nadeem, Sandeep Sharma, Billy Stanlake, Wriddhiman Saha, K Khaleel Ahmed, Abhishek Sharma, T Natarajan. Ajinkya Rahane, Jos Buttler, Sanju Samson, Steven Smith, Ben Stokes, Jofra Archer and Dhawal Kulkarni are the key players of Rajasthan Royals Team. Ajinkya Rahane (c) will lead the RR team. The RR team management may decide to play with the same playing XI. Dhawal Kulkarni, Jaydev Unadkat and Jofra Archer will lead the bowling department. Ben Stokes and Krishnappa Gowtham will play as a bowling department. Jos Buttler and Ben Stokes are the most valuable players of the Rajasthan team. Batsmen: Ajinkya Rahane, Steven Smith, Sanju Samson, Rahul Tripathi. Bowlers: Jofra Archer, Shreyas Gopal, Dhawal Kulkarni, Jaydev Unadkat. Ajinkya Rahane (c), Ben Stokes, Jos Buttler (wk), Krishnappa Gowtham, Sanju Samson, Aryaman Birla, Steven Smith, Jaydev Unadkat, Shubham Ranjane, Rahul Tripathi, Prashant Chopra, Jofra Archer, Mahipal Lomror, Shreyas Gopal, Shashank Singh, Dhawal Kulkarni, Liam Livingstone, Manan Vohra, Ish Sodhi, Stuart Binny, Varun Aaron, Ashton Turner, Oshane Thomas, Riyan Parag, Sudhesan Midhun. The pitch of Rajiv Gandhi International Stadium, Hyderabad will be a batting-friendly pitch. The batsmen will find it easy to score runs on this ground. The spinners can also get some purchase from the wicket in the latter half of the match. Dream11 Fantasy Cricket Tips: Try to take top-order batsmen and spin bowlers in your teams. The weather of Hyderabad is forecasted to be sunny and it will remain the same throughout the day. The sky will be clear and there is no sign of rain today. The temperature is expected to be 32-Degree Celsius and the humidity to be 33%, which may go up to 44%. Hyderabad has a very good record when they play on their home ground. If we look at the statistics of the last five matches, SRH has won four matches and RR has won only one game. SRH has won both the matches in the previous IPL. According to crix11 astrology cricket match prediction, SRH will win the match. The team bowling first has won 33 matches out of 56 matches. According to crix11 astrology prediction, RR will win the toss and opt to bat first. 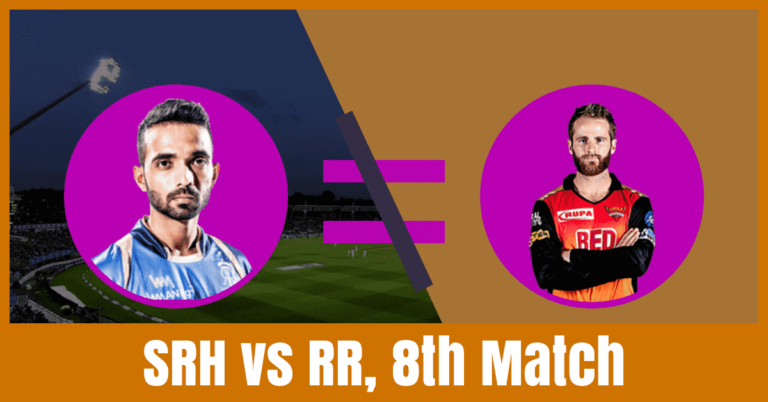 This is it for Today’s SRH vs RR Dream11 Fantasy Cricket Prediction 8th Match. What is your best team? What do you think Who Will Win Today? Leave a reply in the comment section.